David Stockman Exposes The "$20 Trillion Elephant In The Room"
That US stocks returned to record highs last month - picking up steam even as the world teetered on the bring of another debt crisis - has prompted even the most tenacious bears to recalibrate their forecasts, an effort, we think, to appease investors and clients who are luxuriating in the seemingly unstoppable gains of what is now the longest bull market in US history. But while the wash of record returns (on paper, at least) has helped assuage the nagging doubts of many a "rational" investor, others are clinging ever-tighter to a pragmatic - if uncomfortable - realism. And one of the most strident voices among this group has been David Stockman, formerly the director of the OMB under Ronald Reagan and now the author of Stockman's Contra Corner. In a recent interview with Sprott Media in Vancouver, Stockman reiterated that he remains a skeptic, particularly in an era where central banks (thanks to their $20-trillion-plus aggregate balance sheet) have destroyed price discovery and contributed to the blowing of a debt bubble that - when it finally pops - will make the aftermath of the financial crisis appear tame by comparison. Stockman begins his interview by clarifying that he would be optimistic about the long-term prospects for growth and markets if it wasn't for this $20 trillion 'elephant in the room'. "I am an optimist, I truly am - if it weren't for the fact that central banks are totally out of control. So my talk centered on the Great $20 trillion elephant in the room, which is the balance sheets of all the central banks in the world, in excess of what it probably should be in a rational stable historically prudent world"
As central banks have bought up assets, they've repressed interest rates, rigged equity prices and provided the fuel for the explosion of debt that has occurred over the past 20 years, Stockman said. And when the music finally stops - as they say - it will be the central banks that bear the brunt of the blame. "And it's that $20 trillion, built up over the last two decades, that has basically distorted everything - falsified prices, repressed interest rates, caused an explosion of debt. Twenty years ago there was $40 trillion of debt in the world today there is $250 trillion worth of debt in the world. The leverage of the world has gone from 1.3 times which is stable...to 3.3 times, which basically means the world has created a huge temporary prosperity by burying itself in debt. One of the reasons why investors have so easily overlooked this phenomenon is that investors have short memories. They assume that, since this is the way things are today, that central banks have always been this active...but that simply isn't true. "We take these things for granted. 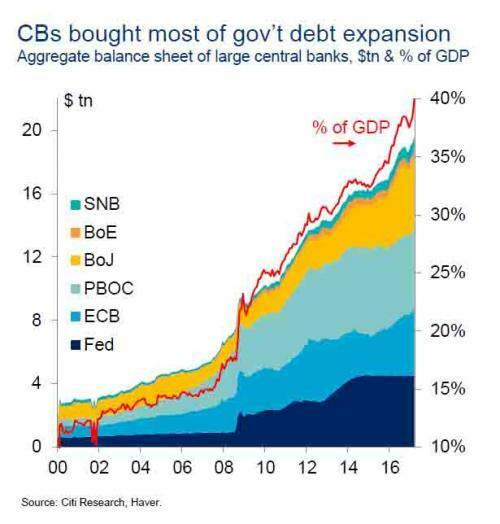 In other words, this has been building for so long now - two decades - that when you have central banks intruding this massively in financial markets...we take it as a matter of course...people assume it's always been that way but it hasn't." 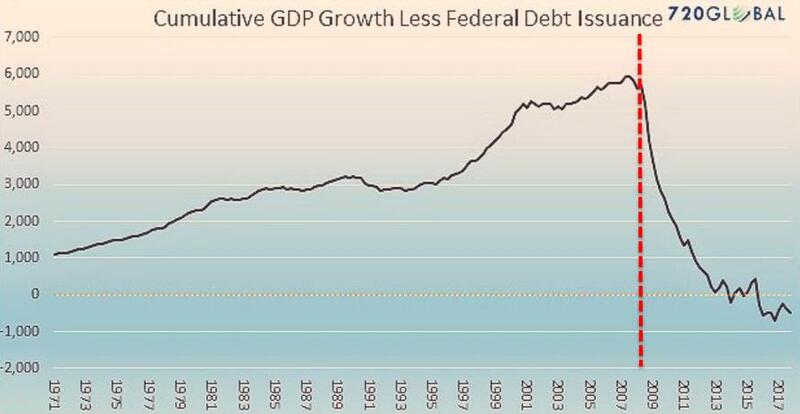 But as Stockman points out, historically, the US economy flourished before this massive bout of debt creation. Even the notion that central banks have created a kind of "temporary prosperity" isn't accurate because our economy is growing much more slowly today than it did between 1950 and 1970. "As far as I know, the world in the 1950s, 1960s and 1970s did pretty well. In fact, real GDP growth form 1954 to 1972 was 3.8% for the last 12 years it has been 1.4%. In other words it wasn't that we had too little debt and our domestic economy lagged and suffered...the opposite is true, the more debt we build up, the more difficult it is to drag these economies forward." Looking ahead to what might trigger the great unraveling, Stockman predicts that a grand policy error - like President Trump's trade war, for example - will help. "Policy makers are going to make huge mistakes that are going to bring the party to an end. Like Trump carrying on this crazy trade war...now he has a point that we haven't been creating good jobs...but it's not the result of bad trade deals but of bad money...and we haven't even begun to cope with that problem." Instead of focusing on trade barriers, Stockman said, Trump shoud be looking "down the street" toward the Eccles Building. "The point is, world wide the average tariff today is 2% of imported goods value. Ours happens to average 1.7%, Canada is 1.59% and France is 1.94% - it's a rounding error. Nobody has meaningful tariffs on most of the goods that are exchanged in world trade." "He should be looking down the street at the Fed, because that's where the whole problem started. The Fed has driven the world to this totally unsustainable debt-driven system." Moving on to examples of how easy money policies have warped valuations, Stockman arrives at his most obvious target: the FAANG stocks that have powered the benchmarks higher. Amazon is one example, Stockman said, claiming that its current valuation, at 160x free cash flow, is simply impossible to justify. "The crash of Amazon it will thunder across the planet," Stockman said. But if he had to pick a poster child for the excesses of contemporary markets, it would be Tesla. "Tesla isn't a car manufacturer, it is a con. It is the greatest short of this cycle. If somebody has a strong stomach, go out and short the damn thing because it will go to zero. It's just living off of raising new money. Anybody can do that as long as you keep the con going. It will end up being the posterboy for this greatest bubble yet of this century." "The market cap is $60 billion going to zero - you can feel that happening. Pets.com was only a couple hundred million."